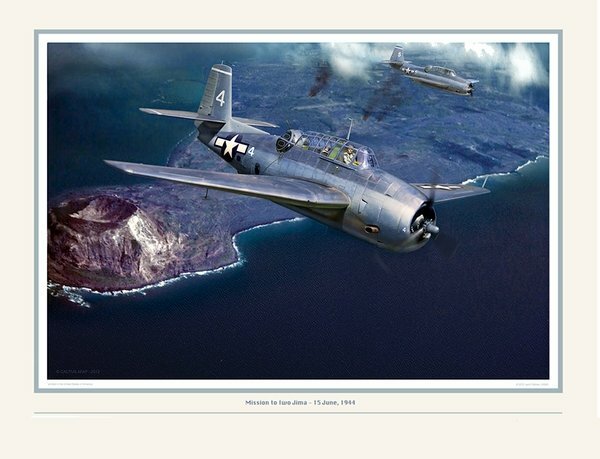 Image Size: 24.5" x 16.5"
Strategically located halfway between Japan and Saipan in the Marianas Island Group, Iwo Jima was an important waypoint for the Japanese resupply efforts as they were losing ground in the Pacific. The U.S. invasion landings on the island of Saipan took place on June 15, 1944, and would have been threatened significantly more by Japanese aircraft had not steps been taken at the same time to neutralize logistical waypoints such as was on Iwo Jima. US Navy Task Group 58.4, with carriers ESSEX, LANGLEY, and COWPENS were sent north to deal with the Japanese airfields on Iwo Jima, and others in the Bonin and Volcano island groups. Lt. David A. Marks, USN, CO of VT-32 (USS LANGLEY CVL-27, Carrier Air Group 32) is seen here exiting the target airfield area on Iwo Jima after having successfully delivered his bomb ordinance-and having had his Grumman Avenger TBF-1C hit by defensive anti-aircraft fire on the dive toward the target. Marks' good friend and rear-seat observer, Lt. Harold G. Payne Jr., USNR was mortally wounded by this AA which also caused extensive structural damage to Marks' Avenger. Marks was able to successfully recover on LANGLEY and was subsequently awarded the Distinguished Flying Cross for his part in this mission and for having led VT-32 on many missions over the Bonins and Marianas.